Coach Whipple has announced Michigan coaches Jim Harbaugh, Don Brown, Greg Mattison and Ed Warinner will attend UMass' football camp on Saturday. Hopefully, some of Michigan's recruiting prowess will rub off. The Macon Telegraph ranks Georgia's opponents for 2018. We're ahead of Austin Peay! 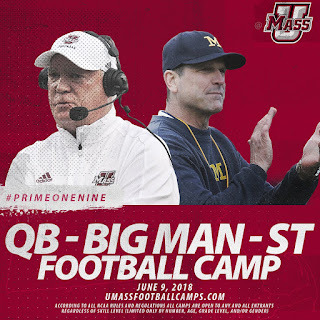 It was positive enough that Michigan would be represented at the camp, but the confirmation that Jim H. and Don B. will be here as well is excellent news. I assume this goes back to the Don/Whip connection. Let's keep it going! I would think even Mr. Anonymous/SMFH would be happy with this! B. I wouldn't bet on on it. So true. It's great for Massachusetts high school players in general. With Harbaugh and Brown in attendance, it wouldn't surprise me to see this event continue to grow, to become more prominent than BC's, and with more programs and coaches represented. Great for Michigan, hopefully we get some scraps when they are done. Death, taxes and Mr. Anonymous spreading UMass cheer.